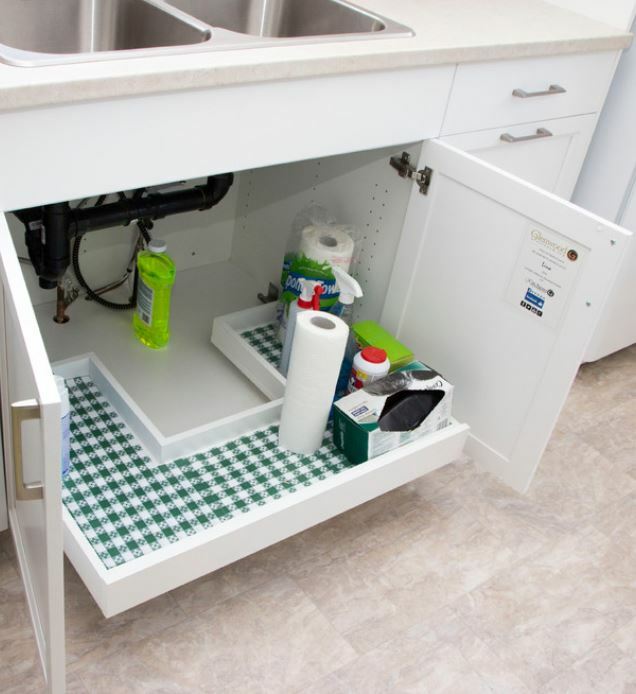 Under kitchen sink storage cabinet is a great place to store your cleaning supplies or garbage bins. Though the pipes below the kitchen sink make the task a bit difficult we can still manage to do so. Most of the time, the area beneath the kitchen sink is left unused. But it has a lot of potential; you can turn it into a nice storage space. 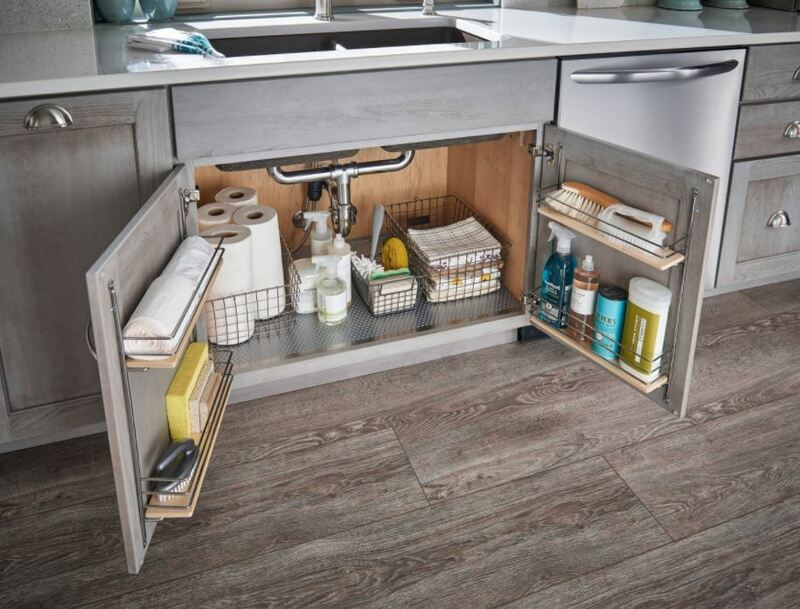 There are some cleverly designed cabinets and pull-out drawers available in the market for under kitchen sink storage organization. 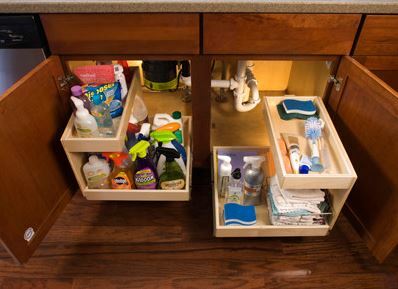 Go for a U-shaped pull out tray to store your cleaning supplies and garbage bags. Install it under the kitchen sink and keep frequently used items in it. 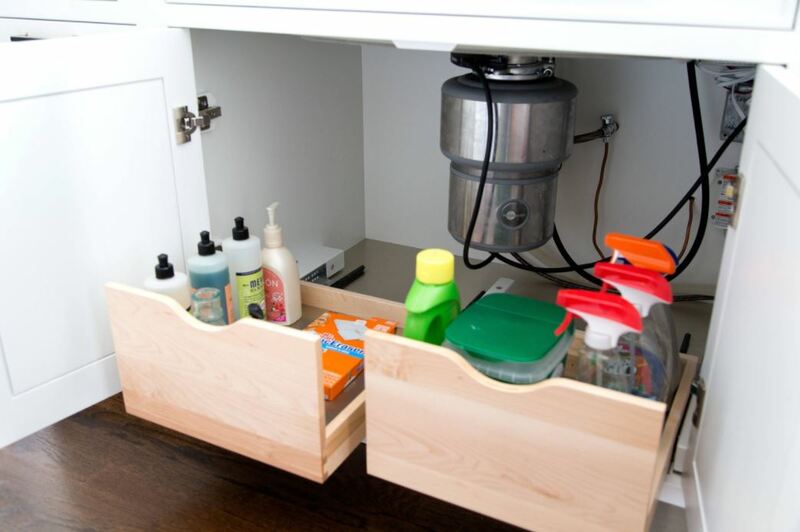 Here is a solution for under kitchen sink storage. 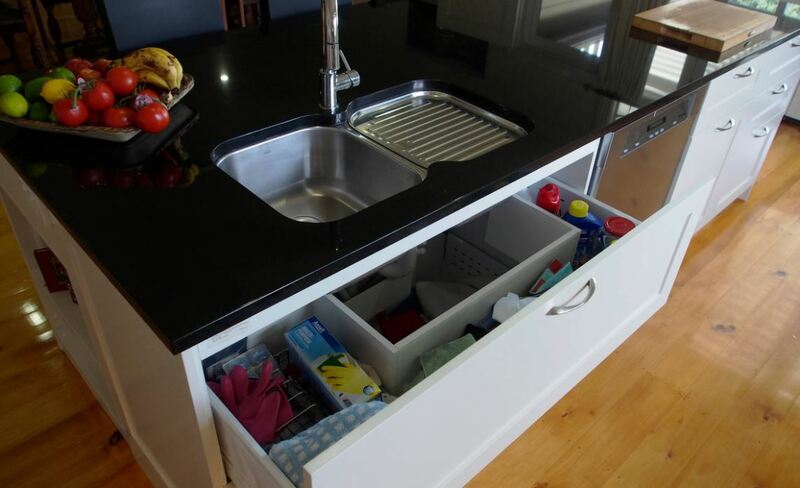 A drawer and a couple of pull-outs on either side are great for being able to access things at the back. Put the space in front of the sink to use. 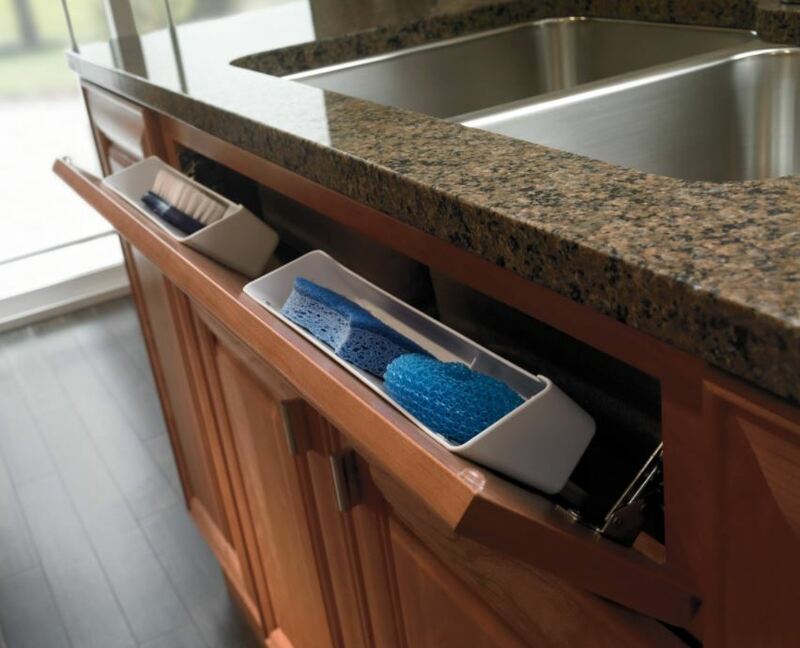 Add a tilted drawer wherein you can store your wet sponges and scrub pads. 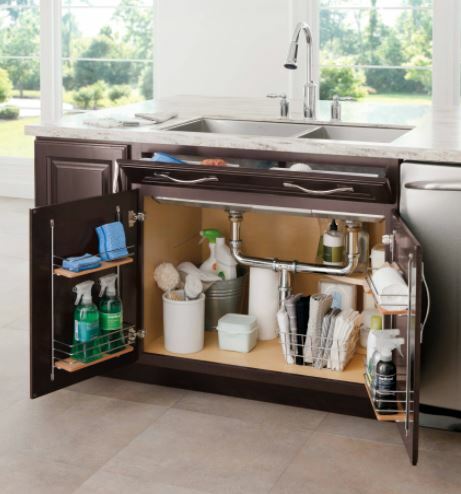 Organize miscellaneous kitchen items under the sink. Get a large drawer to store them all. Make sure wood used for drawers and cabinetry is water resistant. 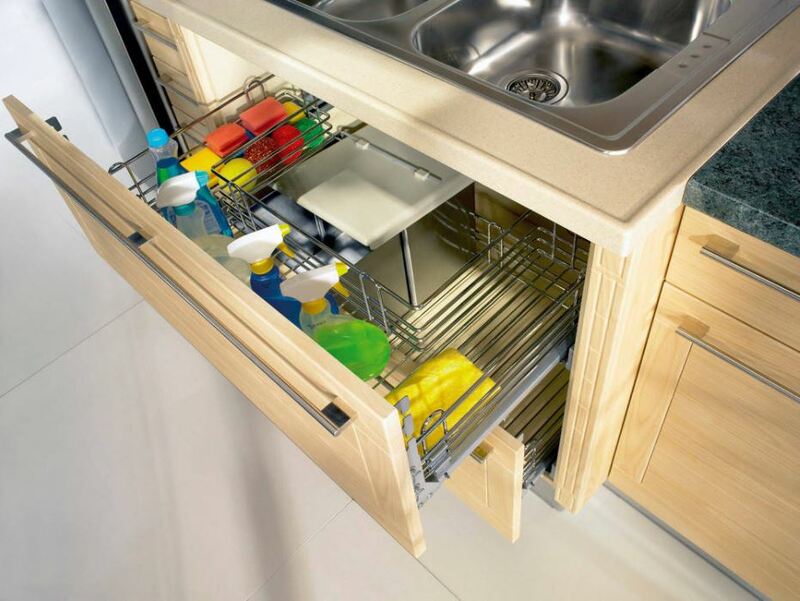 Add racks to the cabinet door in order to create some extra storage under the kitchen sink. 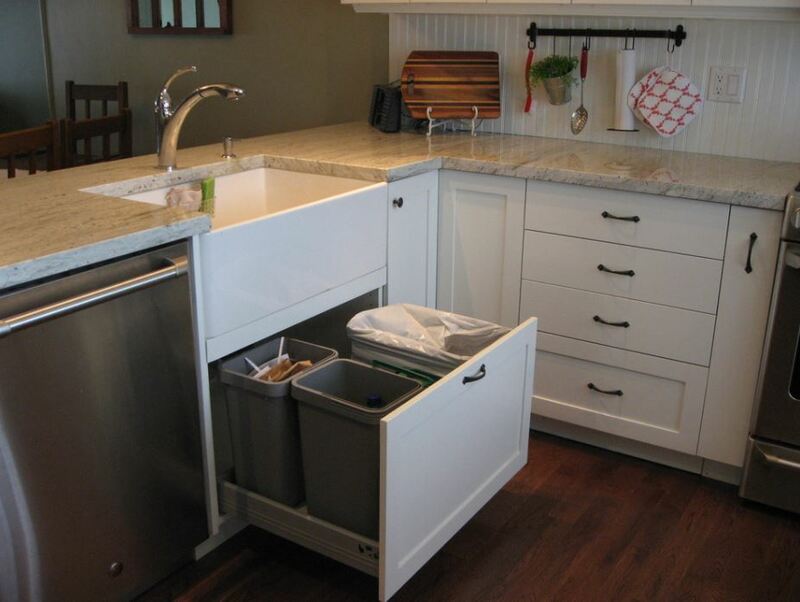 Place bins and wire baskets to store kitchen cloth and cleaning items in there. You can keep your garbage bins underneath the sink. Go for separate bins for garden, recyclable and non-recyclable waste. Work around the pipes to make the most of the available space. 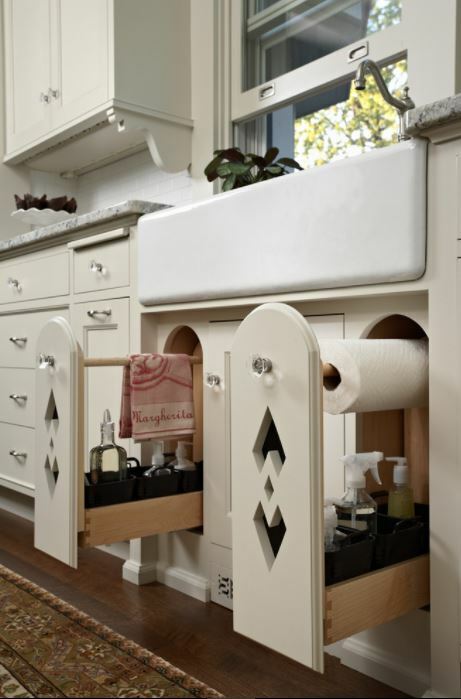 These double pullouts offer lots of space to for storage and organization. 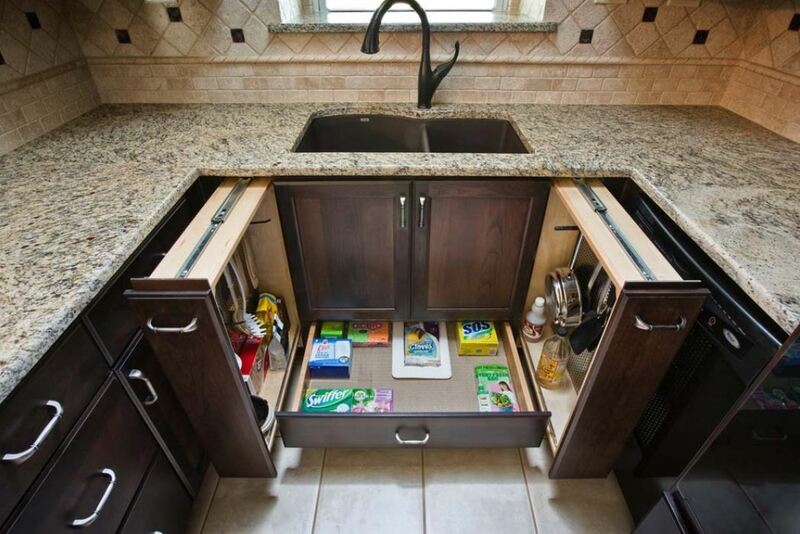 Get a couple of custom made pull out drawers under your kitchen sink. They can help you organize better. Stylish way to stock and store cleaning items out of sight. Divide the area under the sink into three parts. Create two pull out drawers on either side and leave the mid part having pipes closed. Install drawers with U-shaped wire drawers that allows air circulation. This entry was posted in Kitchen, Kitchen Designs and tagged How to Organize under the Kitchen Sink, Kitchen Sink Storage, Kitchen Storage and Organization Ideas, Kitchen Storage Ideas, Kitchen Storage Ideas for Small Spaces, Kitchen Storage Solutions, Small Kitchen Organization Ideas, Under Kitchen Sink Cabinet, Under Kitchen Sink Organization, Under Kitchen Sink Organizer, Under Kitchen Sink Pull out Storage, Under Kitchen Sink Storage, Under Kitchen Sink Storage and Organization, Under Kitchen Sink Storage Cabinet, Under Sink Organizer, Under Sink Storage, Under the Kitchen Sink Organizing by Homemakeover. Bookmark the permalink.